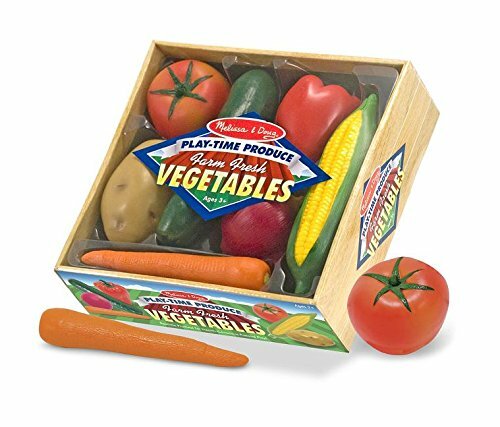 A great way to pretend to role play grocery shopping in the comfort of your home. Ever had to go grocery shopping with your children and then they turn into tearaway horrors? Of course not, It probably only happens to me. Well, just in case you have suffered a similar experience, why not practice grocery shopping at home and get educational as you teach them how you would like them to behave before you get there. Or... Maybe scratch all that noble stuff about teaching and discipline and just have fun shopping at home. 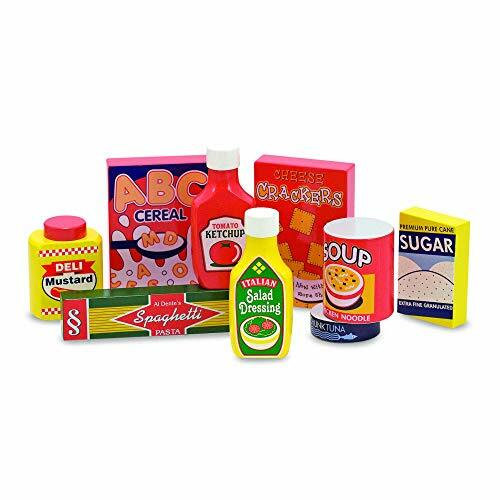 Take a look at this selection of great pretend shopping items that can be used to create fun grocery games for kids...and the adults involved! To begin, as you walk into the grocery store, you need to get a shopping cart. Of course, you do not want to have to assemble the shopping cart yourself so getting this 'Step 2 Grocery Shopping Cart' will meet that need. You do not want it to break under heavy, continuous use and also it might be used as a walker by any younger children so we need the center of gravity well positioned so it does not tip when the hande is leaned on. 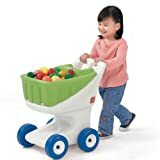 The 'Step 2 Grocery Cart' is durable and sturdy enough to be used inside or out so it meets all your little helper's needs. It even has space for a doll (...or teddy or action figure) to sit facing 'Mom' just like the real deal. The Shopping cart also has rounded corners so no sharp hard edges and easy to clean. The fact that this toy shopping cart is not pink is a bonus as it is not exclusive to girls. Any little shopper will love it. Next we need a stall to buy our groceries from and to the rescue comes this 'Melissa & Doug Deluxe Grocery Store'. You will have to put this one together but it should only take an hour or less. The Stall itself is very solid and sturdy, just as we would expect from the Melissa and Doug brand. The plastic bins could be stronger but I suppose they were designed to carry food, not crazy jumping children. Now we need grocery items to buy. What good is a stall if there is nothing on the shelves? How frustrating for shoppers! 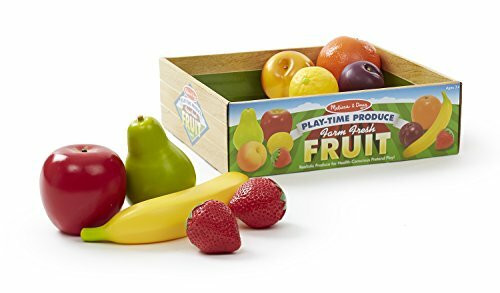 Thankfully, Melissa & Doug Save the day again by providing endless ideas for food items. 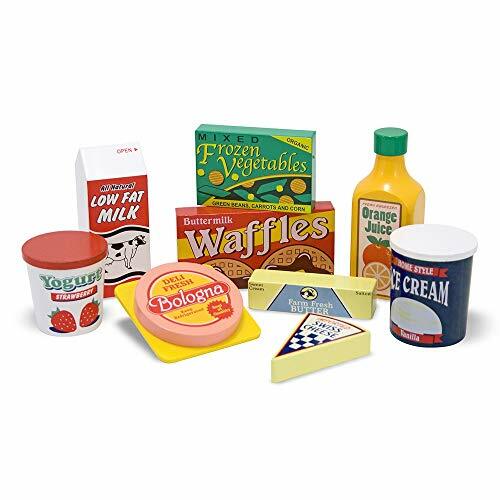 Of course, there is always the option of using your own regular food at home as some kids get annoyed with the empty grocery boxes. It does depend on how much damage your foodstuffs can take and still be useful for consumption. So, all the food has been picked out, now it is time to pay - No free lunch in America after all (or so my mom kept saying!). 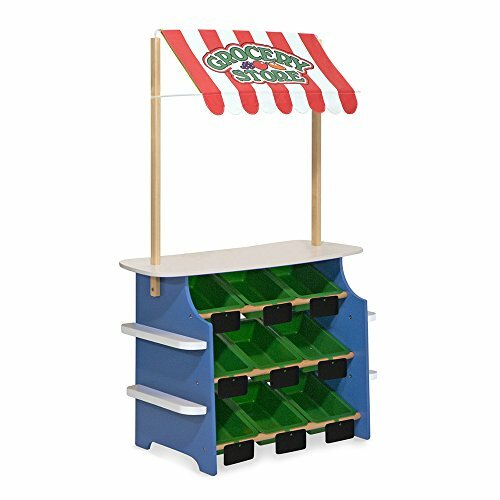 A cash register is required and what could be better than this 'Learning Resources Cash Register'. 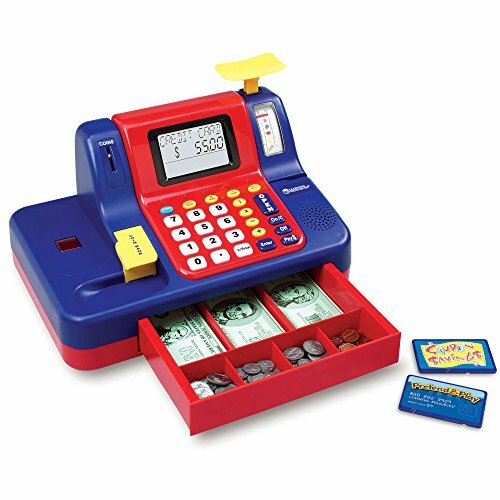 This Learning Resources Cash Register has been around for a long while and still people are finding out just how amazing it is. The most negative thing about it is the way the cash drawer shoots open, spraying money everywhere. This can be rectified by teaching your little one to place a hand on it to guide it open before pressing the button to open the cash drawer - A fairly simple solution. The cash register comes with a scanner and a scale to measure out weights of fruit, vegetables, meat and anything else that needs to be weighed. There is space in the drawer for real money or you can use the pretend money that comes with the cash register. Use this to teach children to add, subtract and how to shop just like adults do. 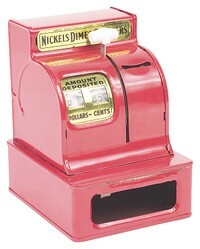 This cash register has won at least two Oppenheim Awards which confirms its quality. Well, as all the shopping is done and paid for, you can now push the shopping cart to the car park and load up your ride-on car boot.